Haolin Munk Band Together Video Shoot at the Factory Media Centre. Photo Cred: Alex Zafer Photography. Here’s a show that’s near and dear to my heart (full disclosure: I play in both of the bands), Canadian Winter with Haolin Munk (and guests) will be playing at Homegrown Hamilton on August 24th as part of the Steel City Jazz Festival. 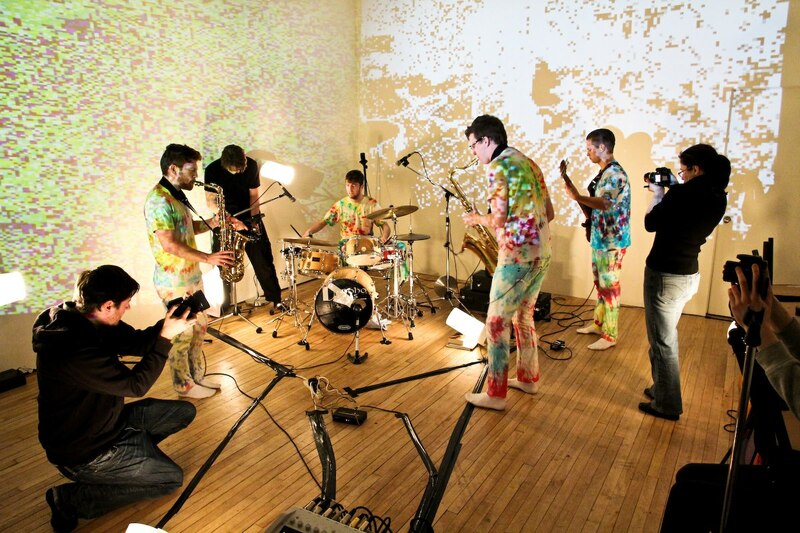 That’s Haolin Munk in the picture up above, wearing tie-dye everything (we made it all ourselves) and shooting a video for a song we wrote called Kit-Kat, a funky afro-beat tune. We also play a lot of hip-hop covers, enough that at our last show we had five local MCs onstage rapping with us. The point is, you might not peg us as a traditional jazz band. But jazz music is what we first learned to play, it’s the vocabulary we use to express ourselves, and every song we play is necessarily informed by our experience with and love for jazz music. I’d like to think we bring that same mentality when playing with Canadian Winter, a Hamilton-based hip-hop group who won the 2011 Hamilton Music Award for Hip-Hop Recording Artist of the Year. Canadian Winter mastermind Kobi Annobil recruited Haolin Munk after hearing some recordings on our Soundcloud as part of his quest to form a 10-piece live hip-hop juggernaut known as the Snow Beach Players. The Snow Beach arrangements of Canadian Winter tunes leave plenty of room for jazz-informed interaction, communication and theatrics; the full group likely can’t be in attendance on the 24th, but you can be sure even a partial lineup will bring a serious jazz/hip-hop one-two punch. Now you might be asking, who are these mysterious friends? For now their identities will remain a mystery, but here’s a hint: Haolin Munk’s irreplaceable bass player Josh is away all summer, but that doesn’t mean the band isn’t working. Haolin Munk are going back to their jazz roots to investigate the music of their favourite bass players (Mingus and Jaco to start) without a bass player, featuring a few new friends along the way. Want to hear the result? You’ll have to come to the show! August 24th, 9pm, Homegrown Hamilton, PWYC. See you there!